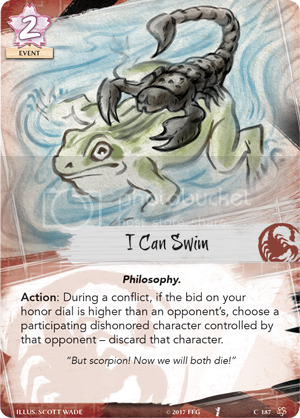 Action: During a conflict, if the bid on your honor dial is higher than an opponent's, choose a participating dishonored character controlled by that opponent - discard that character. "But scorpion! Now we will both die!" For one influence this is a great late game card. Wait for a turn where a big thing is dishonored, bid 5, get a full hand and then blast them with this. It would slow the honor rocket a bit but it's great defense. This is very strong. Considering a RING gives you the ability to dishonor a personality, you can almost reliably pull this off.